Photos from other consumers add trust and legitimacy to our brand, and help shoppers understand how our products fit into their active lifestyles. Since they first shook up the baby care products market, Munchkin has brought together a community of loyal customers: happy parents and happier kids. By consistently delivering innovative and high-quality products, Munchkin has built a beloved lifestyle brand for families that know how to have fun while staying safe! One of the obstacles eCommerce marketers face is putting products in context. 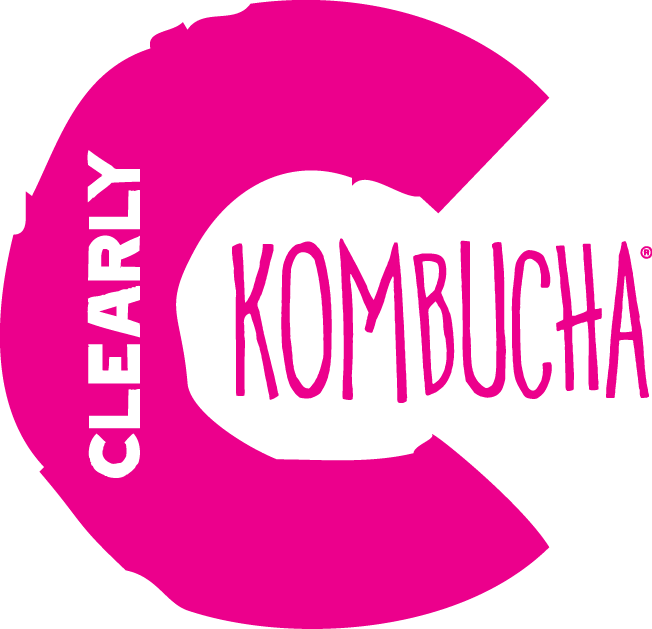 It is often hard for shoppers to assess the quality or use of a product without holding it as they would in a brick and mortar store. Munchkin looked to engage its brand community to educate buyers online and to contextualize products. By sharing stories from real people, Munchkin offers a more authentic experience that builds trust with shoppers. In addition, sharing user-generated content helps bring products to life; Whether that be a mess-saving sippy cup or (the Pixlee team's favorite) an inflatable rubber ducky tub that goes beyond bathtime. To handle the process of managing and optimizing customer-generated stories, Munchkin partnered with Pixlee to discover and curate thousands of high quality photos and videos shared by real customers. Without high engineering overhead, Munchkin was able to publish these authentic customer stories across its website, social, and other channels. Munchkin was looking for new ways to extend the value of its customer stories elsewhere in its marketing. With Pixlee’s new email solution, Munchkin was amongst the first brands to extend the value of their highest performing customer photos to email marketing. “We’re very excited about the work we are doing with Pixlee and how it is helping our email performance. Pixlee’s solution is easy to use, saves us time, and helps create a strong connection with our consumers in our emails." Using Pixlee, Munchkin can identify the user-generated content performing best in its eCommerce store, Shoppable Instagram, and other user-generated content displays and publish it in its email marketing campaigns. UGC collected with Pixlee published in Munchkin emails. 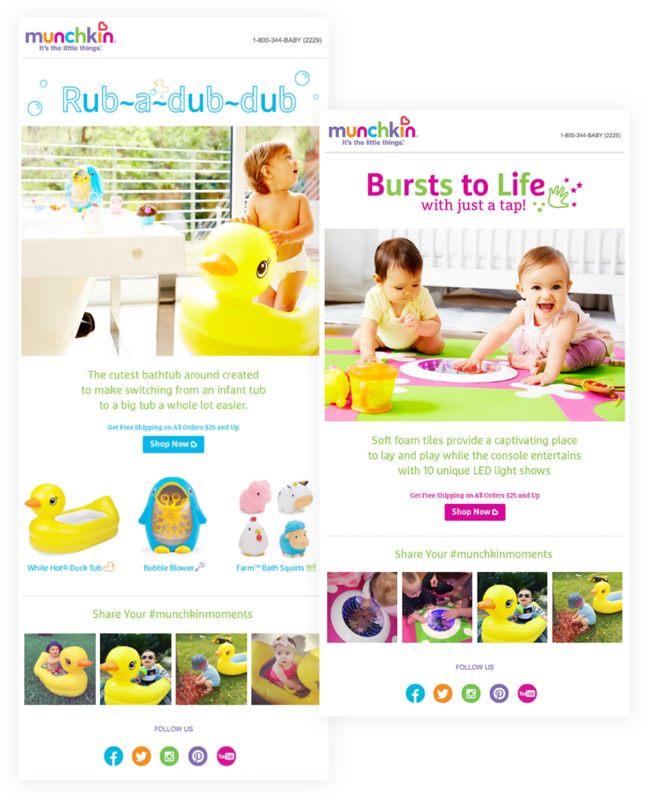 Beginning with individual product promotions, Munchkin selected its highest performing user-generated content featuring specific products and published it in tailored email marketing campaigns. Using Pixlee's out-of-the-box display and its Bronto email platform, Munchkin brought dynamic high-quality customer photos to life. This allowed Munchkin's marketers to avoid content fatigue and to create enough content to supply their various email campaigns. 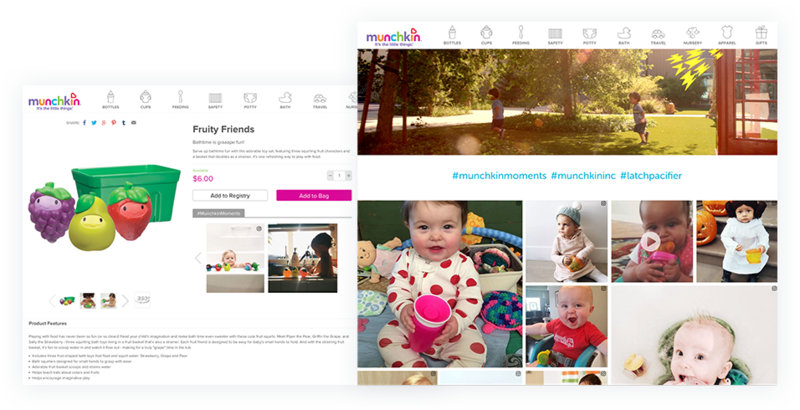 By managing user-generated content in the Pixlee dashboard, Munchkin can supply its Bronto email blasts with product-specific photos and videos that never get old.